About four years ago, my mom decided to move my great aunt Hilda from her apartment to my mom’s home. At the time my Aunt Hilda was 100 years old. Her health was in bad shape and it seemed she would require additional care which my mother could better provide by having her live in the same house. So my sister and mom (as well as cousins, aunts, uncles, and maybe my brothers), took on the task of packing up the apartment which had been home to many, many years of saving. Saving stationary; saving pads of paper, books, pens, pencils, purses, clothes, magazines, linens…the list goes on and on; and it wasn’t even that big of an apartment! But Aunt Hilda managed to save many of her treasures which also serve as (mint condition), historical markers. One such marker I was fortunate to receive. It is a small tin, coral colored, filled with cotton. 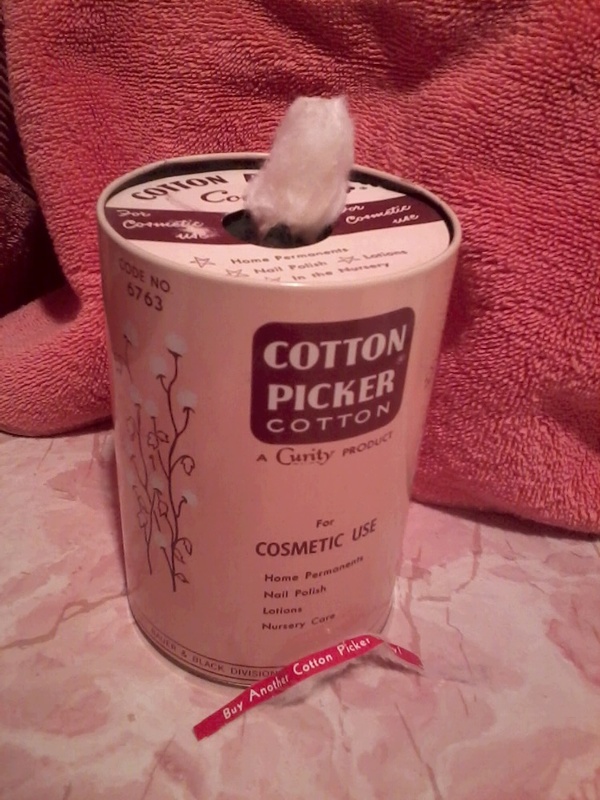 It is called the, “Cotton Picker Cotton”, a Curity product. It was sealed and ready to be used. If you have been to my house, you know that one of our two bathroom’s is decorated with the colors salmon, pink, and orange. Since we live in a house built in the year 1956 and since the sink console is original to our home, the Cotton Picker fits very well with my motif! “NOW HOW IN THE HELL AM I SUPPOSED TO DO THAT?!? I MEAN REALLY, WHERE THE HELL AM I GOING TO GET ANOTHER COTTN’ PICKN’, COTTON PICKER?! ?” And then I laughed at myself, and my own absurdity (I think I even gave a shout out cursing toward my sister, Leah, for salvaging the darned thing for me in the first place…yeah I’m pretty sure I did!). Oh dear, Audrey, don’t remind me of the longevity on my maternal side. I definitely pretend I only have my father’s blood running through my veins…living forever is too daunting!